We humans are a quarrelsome lot. But one thing that unites us is the time spent on our backs, gazing at clouds for the pleasure of identifying whatever objects they may fleetingly resemble. It’s a very relaxing activity. Thomas Lamadieu, the artist whose work is showcased above, has a different, but not wholly unrelated condition. Most of us prefer to contemplate the heavens in a bucolic setting. 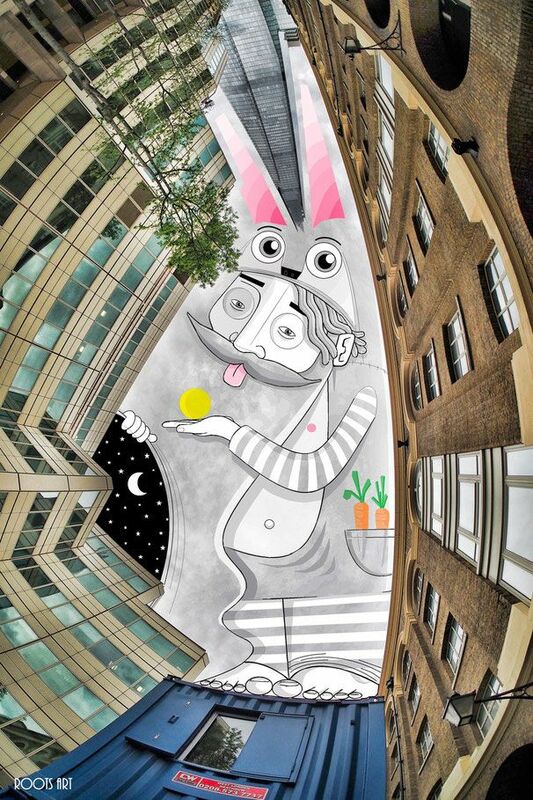 Lamadieu’s art compels him to look upwards from a more urban landscape. The tops of the buildings hemming him in supply with irregularly shaped frames, which he captures using a fish eye lens. Later, he fills them in with Microsoft Paint drawings, which frequently feature a bearded man whose t-shirt is striped in sky blue. Negative space, not Crayola, supplies the color here. Think of it as street art in the sky. Not every day can be a brilliant azure, but it hardly matters when even Lamadieu’s grayest views exhibit a determined playfulness. It takes a very unique sort of eye to tease a pink nippled, stripe-limbed bunny from a steely UK sky. Like many street artists, he takes a global approach, traveling the world in search of giant unclaimed canvases. His portfolio contains vistas originally captured in Hong Kong, South Korea, Germany, Spain, Austria, Canada, Belgium, and the United States, as well as his native France. “The bearded man in my images stands for the sky itself,” he told The Independent, adding that his is a wholly secular vision. View a gallery of Lamadieu’s sky art here.